Too often, we hear from customers who have had previous poor experiences with hiring a lawn care company in Allentown, Bethlehem, and Easton, PA. They may have been duped by what they thought they were getting for their investment. We believe a lot of this can be prevented by knowing some truth-revealing questions to ask before hiring a lawn care service. Experience is important and one of the best ways to gauge whether a lawn care company has it is to ask how long they’ve been in business. The trouble with brand-new businesses is that they sometimes turn out to be fly-by-night companies that don’t stick around that long. We’ve heard horror stories of people who have gone through the process of hiring a lawn care service only to have them pick up and leave town with no notice, sometimes even cheating them of owed services with no refund. 2. Tell me about your company’s specialties and what you offer? There is often a misconception that all lawn care companies offer the same services but that’s simply not true. That’s why it’s also really important to ask a lawn care company about what the company specializes in. If they are a company that attempts to be a jack of all trades and does a little bit of everything, you might be concerned about their level of lawn care skills. 3. What's the level of expertise and tenure of your team? Another important way to gauge skill is to ask about the team’s level of expertise and average tenure. Is this a company that performs regular training to ensure that team members remain at the top of their game? Or do they just scrape by with the bare minimum? You might also ask about credentials to see if this is a company that is going out of its way to get licenses and credentials for a good majority of its team members. Credentials also require continuing education in order to keep them current. Do their credentials just include registering them with the State of PA? Or are they pushing their team to become true lawn care experts? 4. What’s my lawn technician’s story? When you talk to a lawn care company about their team, you’re looking at information about the collective group. But you should also ask about the individual team member who is going to be servicing your property. Ask the following questions of the specific technician who will be working with you. How long has this technician been performing lawn care? 5. How is your program different than most other companies? 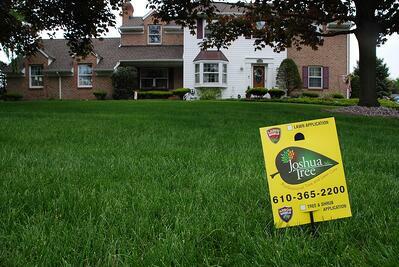 If you’re trying to compare one lawn care company in Allentown, Bethlehem, or Easton, PA to another, then what better way to find out how they might be different than to simply ask! That might feel awkward to you but here’s the truth—for us, we already know you’re comparing our lawn care company against others. As an educated consumer, that’s what you should do! But we also know our competition and we know how our program is different from theirs. We’re more than willing to share that information. 6. 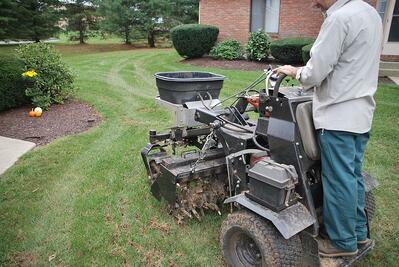 What treatments are included in your lawn care programs and what are potential extras? It’s also important to find out what treatments are included in a lawn care program. Of course, what’s not included is just as important. Any treatments that are not included in the program (and are actually needed) could be add-ons at a later date. In fact, this is a common way that a lot of lawn care companies can reel you in. They’ll sell you on an inexpensive lawn care program knowing full well that your lawn will need more services in the future. Then they’ll upsell you on lots of those services at a later date and you could even being paying more in the long run than hiring another lawn service you were considering at the onset. It’s always good to be confident that everything you will typically need is included in the lawn care program you’re investing in. 7. Are your products safe? 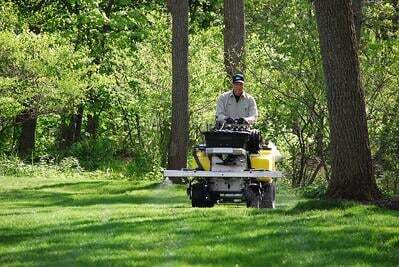 Do you spray lawns, or use granular? This is a question that we get asked all of the time. 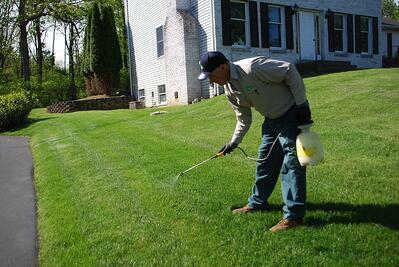 We understand that homeowners are concerned about safety and sometimes even compare us against organic lawn care options that they’ve heard about. But the truth is, when applied properly and by a trained professional, lawn care is very safe. At Joshua Tree, we use products that are not harmful to the environment and remain safe for your family and pets. On top of that, we take a lot of precautions that help keep our services even more responsible. We don’t just go in and spray lawns excessively or when it’s not needed. In fact, we don’t use much spray product at all (another question we’re frequently asked). Besides our professional weed control products, everything else we use is granular. Though spray products are safe when applied properly, we do find that many of our customers prefer that we primarily use granular products. 8. What will happen when I have a question or a concern? Communication is another common concern. You may have heard negative stories from other homeowners who have complained their lawn care company is impossible to ever get a hold of. But if you have a question or a concern, you want to know that you can reach someone. You can be forthright in asking a company about this. Ask them if they have office staff who answers their phone or how long it takes them to return calls or emails. Of course, some lawn care companies may not be completely forthcoming or honest with this information which is where reaching customer reviews can be helpful. If a lot of people are complaining about a certain lawn care company’s responsiveness, take it as a red flag. Also, can someone really answer your question in a meaningful way? Even if they don’t have the answer immediately, to what lengths will they go to get an answer for you? Will they even get back to you or are they just going to hope you forget you asked? Sadly, we’ve heard this happens. Our team loves lawn care challenges and we’ll do whatever it takes to get you an answer. 9. Where can I read what your customers have to say about you? You want to know what other customers have to say about a particular lawn care company and for good reason. When a company has nothing to hide, they should be very willing to share client testimonials (often published on their website) and maybe even give you references that you can call if that’s of interest to you. Of course, third-party lawn care reviews are also a very helpful tool when comparing one lawn care service in Allentown, Bethlehem, or Easton, PA to another. If you ask a company what reviews sites they have been reviewed on and they are reluctant to answer, it might be a red flag that they have a lot of negative reviews out there. While every company gets a bad review once in a while (and you can give them the benefit of the doubt for that), if there’s a recurring pattern of bad reviews, there’s obviously a reason for it and you’ll likely want to stay away. Asking all of these questions might feel like a lot of work—almost like an interview process. But that’s important when you’re choosing a lawn care company that is going to be visiting your property regularly and that you’re trusting to get the results you desire. 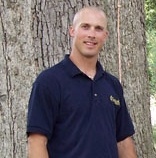 We commend you for putting time and effort to get to truth regarding what various lawn care companies have to offer. We understand that you want to feel confident that you’re investing wisely in a company that you can trust. By putting in the hard work and asking these truth-revealing questions, you’ll be able to feel confident in your decision. If you’re considering hiring a professional for your Allentown, Bethlehem, or Easton, PA lawn care needs and have more questions, we’re here for you! Get in touch with us to get some free expert advice and learn more about our lawn care program options.